The O.M.S. 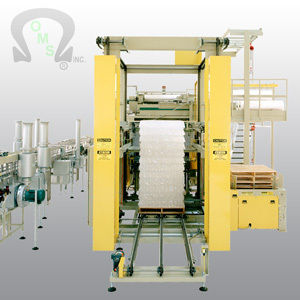 Fully Automatic Layer Bagging Bulk Palletizer provides for a variety of individual customer blow molding production speeds. O.M.S. 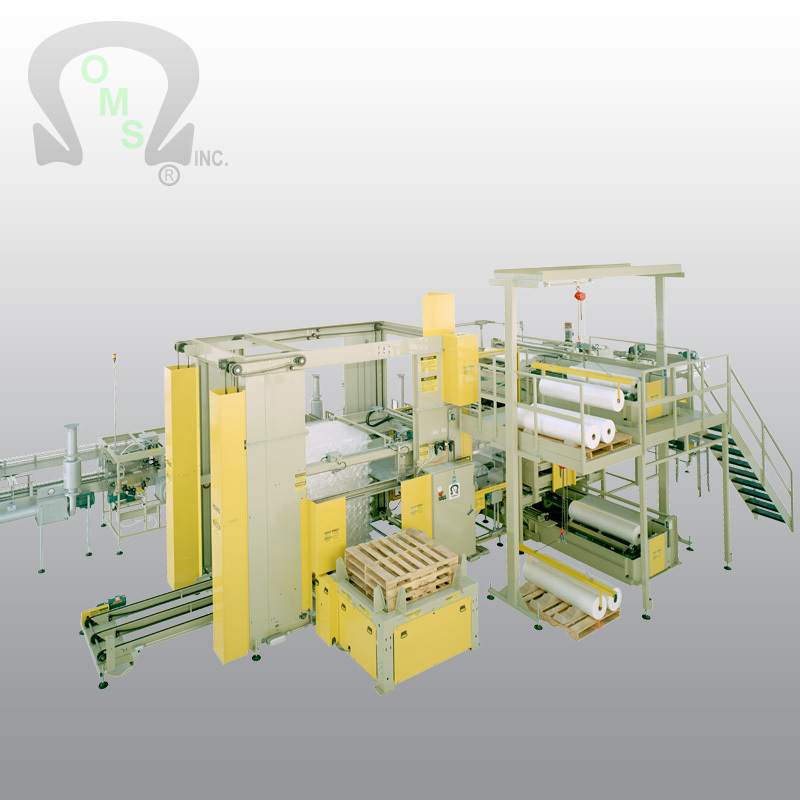 Layer Bagging Palletizers are automatic from row forming to stacking on the pallet and are equipped with quick change (no tool needed) features, and size/design flexibility. Up to 6 bags per minute and/or up to 48,000 bottles per hour! 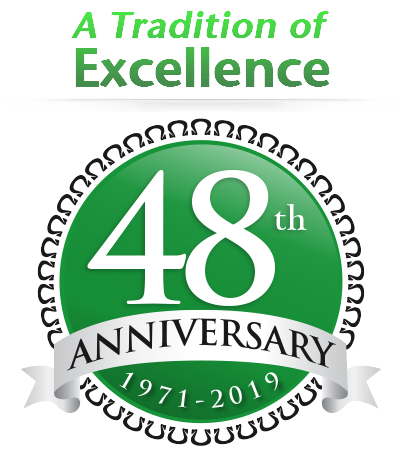 Options available such as: Automatic sequential roll transfer carrier system and roll core chucking with empty core retrieval, & Automatic end of film thermo heat seal/cutting (splicing) to beginning of sequential film roll. 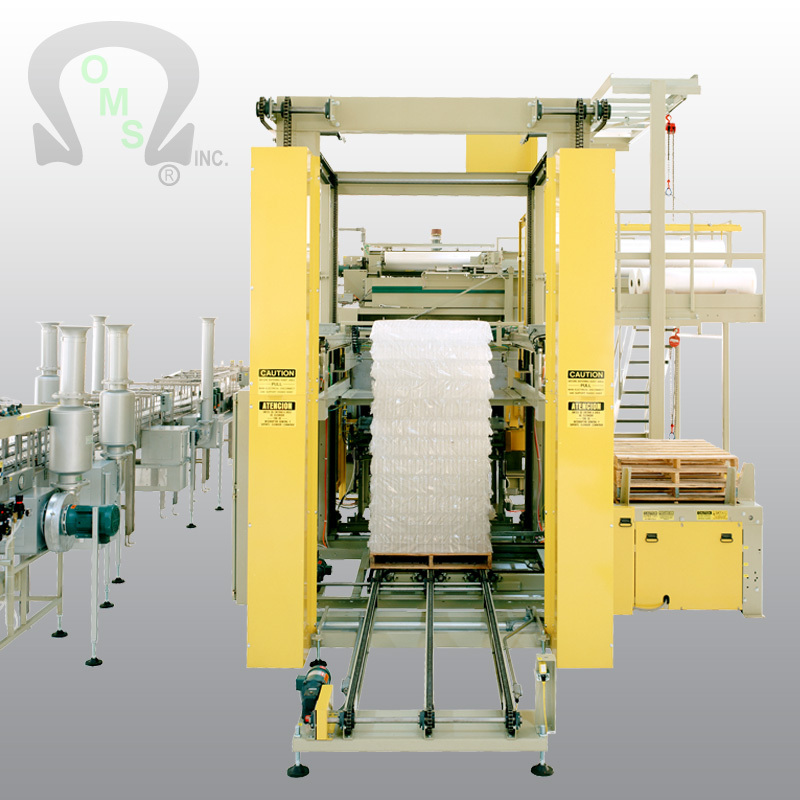 Straight-line flow from row forming, row nesting/layer accumulating, layer bagging, bag transporting and palletizing ensures smooth handling. Bag forming operation consist of two independent rolls of flat film feeding through the layer bag forming module. Seaming of bag sides is electronically achieved and controlled for continuous motion per bag sealing operation. The O.M.S. 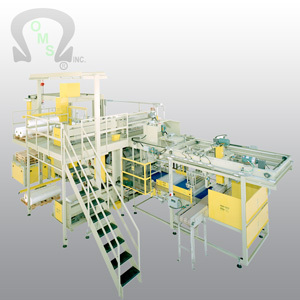 twin roll design provides extended running time between roll change cycles. 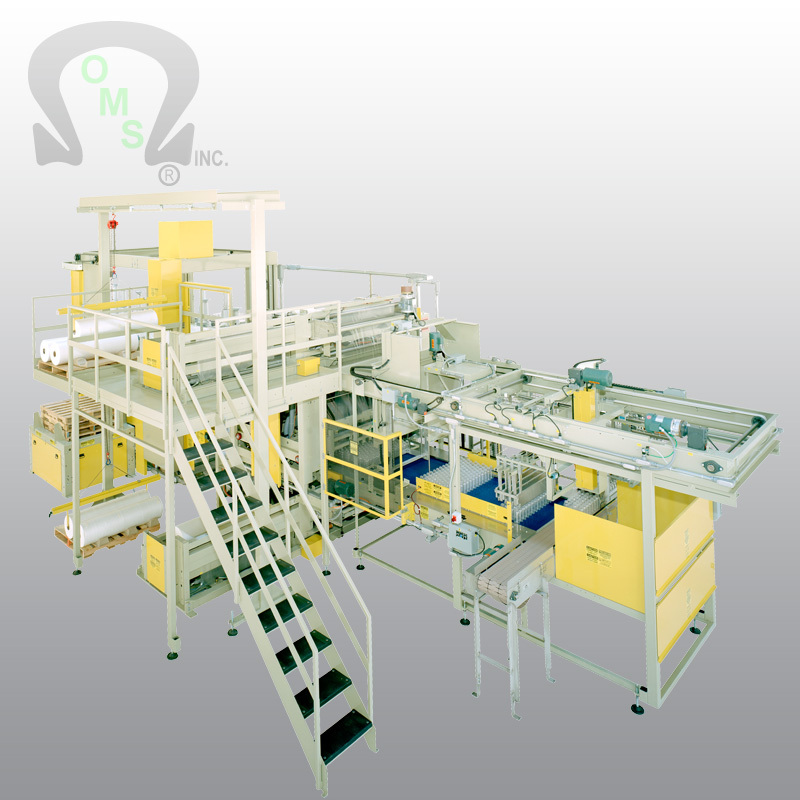 Twin roll layer bag forming combined with straight line flow and continuous motion side seaming operation offers moderate to high speed layer bagging production. Machine will handle bottle heights from 3-1/2″ to 12″. Machine will handle round, square, oval, rectangular, etc., containers. Layer bags from 38″ to 48″ wide and 18″ to 48″ long. O.M.S. 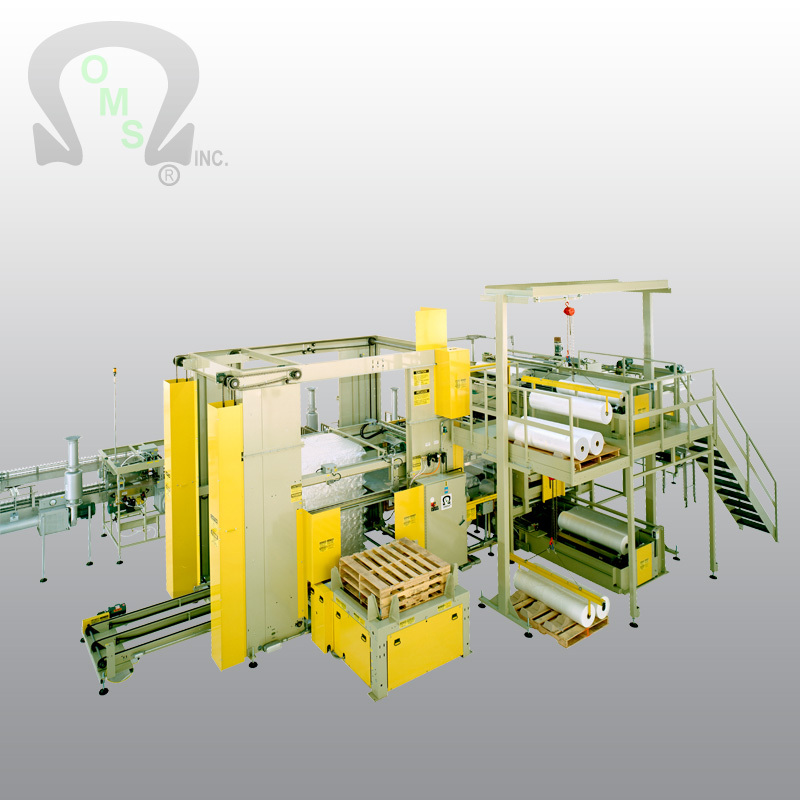 Layer Bagging Palletizers are automatic from row forming to stacking on the pallet and are equipped with quick change (no tool) features. Automatic sequential roll transfer carrier system and roll core chucking with empty core retrieval. Automatic end of film thermo heat seal/cutting (splicing) to beginning of sequential film roll.